Organic mulch is any type of natural material that is layered on the surface of the soil of your garden beds. Mulching your vegetable garden not only helps suppress weeds, it also prevents soil erosion and moderates soil-temperature fluctuations. I was delighted to have an established vegetable garden on the property when I originally purchased my home. After many years stuck in condos and apartments with no yards, I was eager to begin growing my own garden. That first spring, I went to work clearing the weeds and planting the garden. Unfortunately, it didn’t take long for the weeds to sprout up again. I hoed them down. They came back. I dug them up again. They returned with a vengeance. I was spending all my time weeding the garden. It wasn’t fun. Ultimately, I surrendered and allowed the weeds to take over. 1. Added New Raised Beds: The following spring, I built three 4×4 Square Foot Gardens and filled them with new soil. The new raised beds provided a fresh start with nutritious and weed free soil that allowed my plants to grow and flourish without competition from weeds. 2. Mulched the Existing Garden Beds: I started weeding the garden as soon as the ground could be worked in early spring. I added compost and layered the soil with various types of mulch to prevent weeds from growing. Mulch is any type of material that layered on the surface of the soil. Mulching your garden beds not only helps suppress weeds, it also prevents soil erosion and moderates soil-temperature fluctuations. Water, air and nutrients can filter through and reach the soil, but the mulch prevents moisture from evaporating and shades the soil surface keeping the roots cool. 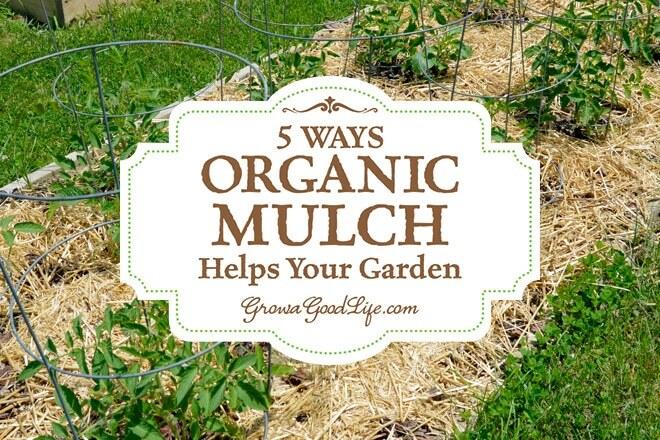 Organic mulches break down over time, enriching your soil as they decompose. A generous layer of mulch will shade the soil and deprive weed seeds of the sunlight needed to germinate and grow. Covering the soil also prevents seeds dropped by birds or wind from coming in contact with the soil surface and taking hold. Mulching helps retain soil moisture by shielding the soil surface from the moisture sapping effects of heat, sun, and wind. Reducing evaporation offers more consistent moisture levels for the plants improving overall health. Some mulch, such as leaf mold absorb and hold moisture much better than bare soil. Mulching the surface of the soil protects it from the eroding effects of wind and rain. The mulch softens the impact of rain and helps prevent the soil from washing away. Covering the soil also shields it from wind blowing the soil particles away. Covering the soil with mulch shade and insulates the soil from the hot sun and summer heat. This helps keep the soil cool and prevents soil-temperature fluctuations that can stress your plants. 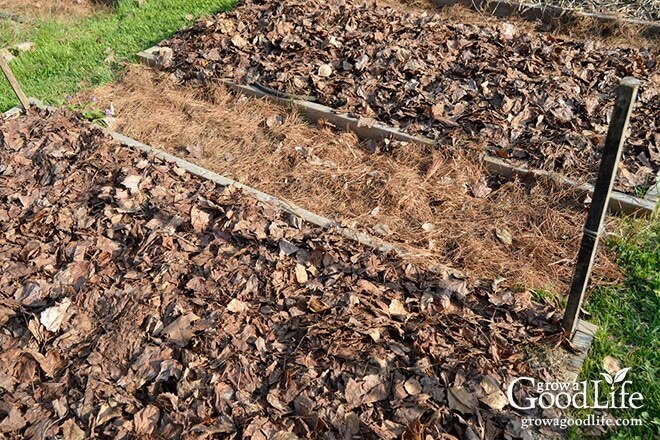 As the mulch decomposes, it furnishes nutrients and humus to the soil improving the soil’s structure, nutrition, and moisture holding capacity. As the mulch breaks down, it also provides food for earthworms, stimulates microbial activity, and encourages beneficial soil organisms. By far, my favorite garden mulch is straw. I purchase a big, rectangle bail in the spring from my local farm and feed store, and it is enough to mulch the whole garden plus extra to line the nesting boxes in the coop. Straw doesn’t compact, breaks down slowly, and lasts for a while. In a pinch, I will also use shredded leaves to mulch the garden. I tried using whole leaves, but these just ended up blowing away and made a mess. Shredded leaves seem to remain in place much better, but they can pack down and form a barrier that prevents water and air from reaching the soil. Remembering to fluff up the mulch every now and then prevents compaction. Pine straw is pine needles that have fallen from the tree. We have a lot of pine trees surrounding our property so pine straw is free. I use these mostly to mulch the walking paths in between the raised beds. Layered thickly, pine straw does a good job of suppressing weeds. It does break down quickly when walked on and needs to be replenished a few times a year. Did I mention it is free? 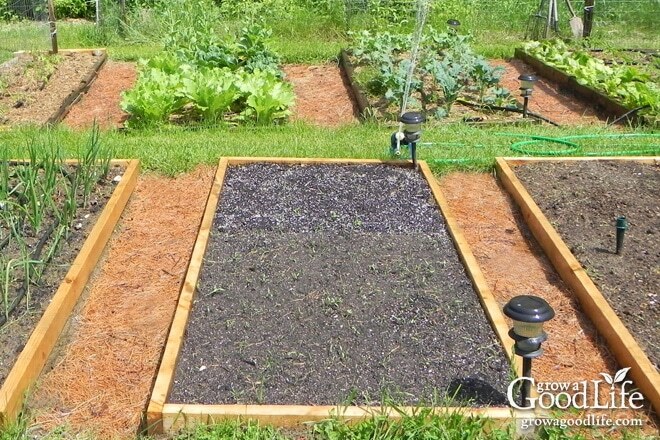 Begin with a weed free, well watered garden bed. 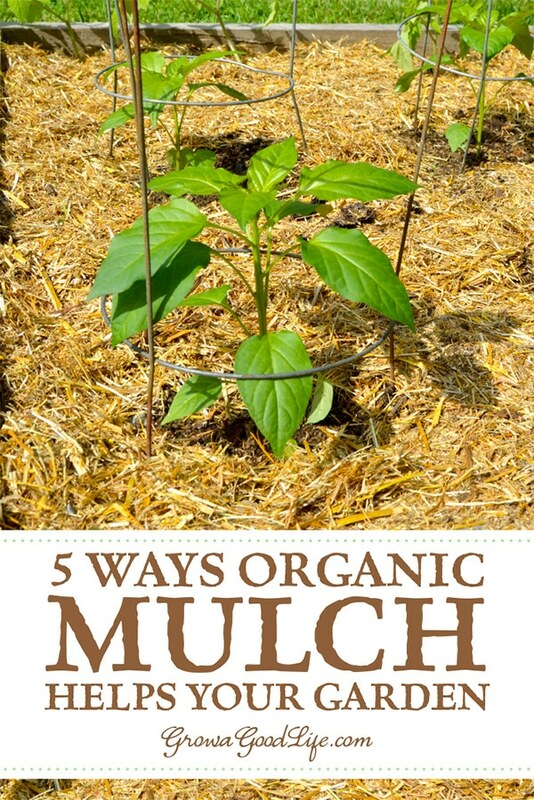 After planting, apply a generous 4-6-inch layer of organic mulch of your choice. If you are using soaker hoses, lay the hoses down first and add the mulch on top. Keep the mulch a few inches from the plants, so they are not smothered. Water well to settle the mulch and help prevent it from blowing away. Routinely pull out any weeds that do sprout up to stop them from going to seed. Add additional mulch during the growing season as needed. Allow the soil to freeze. At the end of the growing season, rake aside the mulch, clean up the garden, add a layer of finished compost, and lightly cover the beds with the old mulch. The reason to cover the beds lightly is to help suppress weeds and protect the soil without insulating the beds. You want the soil to freeze over the winter and warm up in spring. Many fungal diseases and pests are eliminated by the freezing temperatures of winter. Layering the beds with too much mulch could prevent the soil from freezing and provide a nice, cozy environment for pests to overwinter. Mulch when perennials are dormant. Mulch garlic and perennial herbs with a generous layer after the ground freezes and the plants are dormant. Adding a heavy layer of mulch before the ground is frozen can insulate the ground and delay the plants from going dormant naturally. This can cause damage to the roots once the severe winter arrives. Mulching after the ground freezes will help moderate temperature fluctuations and prevent the ground from freezing and thawing, which could cause the plants roots to be heaved out of the ground. In spring, remove some of the mulch once the ground thaws to allow the ground to warm. Rake the mulch aside in spring to allow the beds to warm. When spring rolls around, the beds are ready for planting. Simply rake the mulch aside, pull any weeds that popped up, and sow seeds or transplant seedlings into the soil. Once the plants become established, add additional mulch to the garden beds keeping it a few inches away from the stem. Mulching my garden helped reduce weeds and improved the soil over the years. Using mulch didn’t eliminate weeds completely, but it did reduce the number that popped in the garden. The ones that did grow were much easier to manage. Each year the amount of weeds in the garden decreased as I continued to mulch. As the mulch broke down, it added some much-needed organic matter to my sandy soil. Now I hand weed a bed at a time rather than hoeing the weeds every weekend. If weeds are taking over your garden, and you find yourself spending a lot of time hoeing, consider mulching to eliminate some of the work. I love straw, but now so many farmers are using such horrible chemicals I don’t know where to find safe straw any longer. Tina, Sadly, this is something to worry about in straw and animal manure. Very interested in this. I will try it going forward this fall! I use wood chips on the paths around my raised beds. In the beds themselves, i use a chopped straw product called Mainely Mulch (comes from Maine of course). It is heat treated to kill any weed seeds and the fact it is chopped makes it easy to spread on the beds and around plants. It lasts the season then decomposes well over the winter. Dave, Wood chips in the paths is a good idea. I bet it lasts longer than pine straw. I tried the heat treated, Mainely Mulch this year too with mixed results. I don’t think I was generous enough with it. I found weeds popped up through it quite easily. I think maybe a thicker layer would work better. Now that I volunteer at a farm, I am really aware of the difference between weeding open land and in raised beds. I knew there would be a difference, but wow – it’s pretty dramatic. 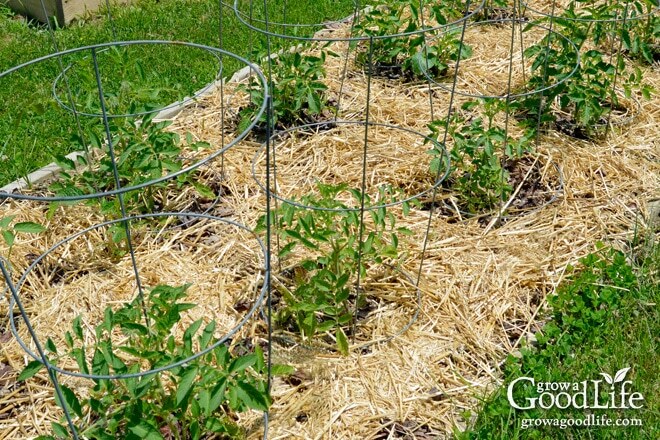 Straw is my favourite mulch for the beds as well & I use wood chips for the paths. The paths, especially, are a lot of work in the beginning but once that initial layer of mulch (and in my case cardboard to smother the grass) is down, maintenance is so much easier. I didn’t know about heavily mulching AFTER the ground freezes so thank you for that tip!